Population: Unrevealed. The entire planet is apparently devoid of sentient life, most having perished at the hands of Mys-Tech's Warheads. Vorin (and possibly Goodfellow) escaped the slaughter, and they found evidence that indicated others may have escaped as well. Places of Interest: Unrevealed, but presumably now in ruins, if not completely destroyed. Most of the planet is now a smoking desert, though some plant life has been seen. Prior to the devastation of the planet, there was an area known as the Sharin Mountains where Vorin was born. (Shadow Riders#4 (fb) - BTS) - Sharin was once a beautiful world. (John Freeman's Shadow Riders Guide) - Vorin was born in the Sharin Mountains. (Shadow Riders#2 (fb) - BTS / Shadow Riders#3 (fb) - BTS) - Sharin was one of the first worlds the evil corporation Mys-Tech discovered via the time-space portals used by their time & dimension-hopping Warheads. Mys-Tech opened a portal to the time equivalent to Earth's 1383 AD, and they devastated the people of Sharin. (John Freeman's Shadow Riders Guide) - Vorin, now an able hi-tech wizard, learned much about Mys-Tech through watching their activities on his home world. (Shadow Riders#3 (fb) - BTS) - Vorin escaped to Earth in its year 1383 AD via his own transit system, which only traversed space, not time. Not wanting to stop Mys-Tech before the date they had first invaded/assaulted Sharin for fear of creating a temporal paradox, Vorin spent the next six centuries challenging Mys-Tech to take their measure, as well as to explore, steal, and adapt some of their powers for his own purpose. He resurrected, empowered, and re-educated a number of slain Mys-Tech agents to oppose Mys-Tech as his Shadow Riders. (Shadow Riders#3 (fb) - BTS) - Mys-Tech dubbed Sharin "Arena World," and used it as the final exercise for Warhead trainees before Mys-Tech risked them on a real mission. (Shadow Riders#4 (fb) - BTS) - The Warheads-trainees (or at least some of them) were told that the people on Arena World were androids so that they would not have any compunctions against destroying them. (Shadow Riders#3 (fb) - BTS) - Warheads-trainee Boot participated in an exercise on Arena World. The natives were given weapons, but they didn't stand a chance and were slaughtered. (Shadow Riders#3 (fb) - BTS) - The Warheads virtually wiped out Sharin's population. (Shadow Riders#3 (fb) - BTS) - After the date of Mys-Tech's invasion of Sharin, Vorin felt free to act against Mys-Tech at last, and he made plans to return to Sharin to arm his people against their attackers. (Shadow Riders#3) - Warheads troop-in-training led by Che (including Hawthorne & McElroy) arrived on Arena World. When Hawthorne, via psi-scan, noted it "sterilized of any life forms," and Che revealed the planet's nature/history under Mys-Tech. The Warheads were then attacked and nearly wiped out by the Slaughterhouse Six before Mys-Tech board member Eadmund Porlock appeared and apologized to Che, noting he had asked for some Warheads to test the Slaughterhouse Six, but did not know Rathcoole would select Che. Porlock then briefed Che on his plans to use Arena World as a trap for Vorin and the Shadow Riders. (Shadow Riders#4 (fb) - BTS) - Vorin suspected Mys-Tech might try to lay a trap for him, but his desire to return home overrode his concerns. He asked Goodfellow to follow the other Shadow Riders to Sharin but to stay out of sight. (Shadow Riders#3) - Using Matthew Ryan, a powerful energy manipulator the Shadow Riders had seemingly freed from Mys-Tech (actually, it was a trap, as Ryan was actually Abadon, a powerful entity enslaved by Porlock and prepared as a trap against the Shadow Riders), Vorin and the Shadow Riders to breach Mys-Tech's wormhole to reach Sharin; en route to the Annapurna, India Mys-Tech base, which contained the portal to Sharin, Cable joined the transport. Porlock prepared a nominal opposition so the Shadow Riders wouldn't realize they were intended to go to Sharin, and the Shadow Riders fought their way past and entered the portal. Vorin was devastated to find Sharin had become a wasteland and that his plans were foiled; he vowed Mys-Tech would pay with their souls. 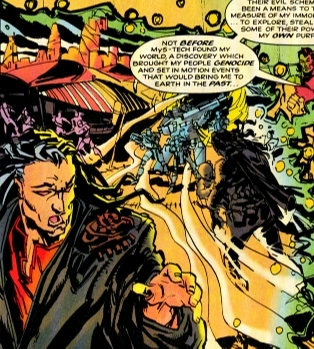 The Slaughterhouse Six then ambushed the Shadow Riders, during which time Porlock arrived and activated Ryan, transforming him back into Abadon, who then incapacitated the Shadow Riders and Cable. Porlock revealed his master plan and commanded Abadon to slay them all. (Shadow Riders#4) - Goodfellow of the Shadow Riders arrived on Sharin and blasted Abadon with a particle disruptor, allowing the other Shadow Riders and Cable to escape their containment field. Meanwhile, Che ordered the Slaughterhouse Six and remaining Warheads to hold back until Porlock's command (as Porlock had previously instructed, but which he also hoped might allow Cable to escape). 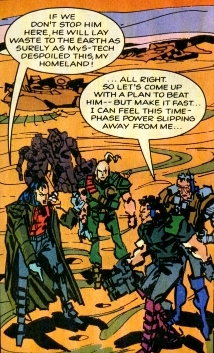 Goodfellow transported one of the Slaughterhouse Six's time-phase power to shift the Shadow Riders, Cable, and Che (so Abadon would not discover he was a traitor to Mys-Tech) out of phase, so that they could continue to view Porlock and Abadon unseen. Porlock sent the Slaughterhouse Six and other Warheads back to Earth, then prepared to follow them. He ordered Abadon to slay Cable and the Shadow Riders upon their return, but Abadon accused him of cowardly fleeing, then attacked and overpowered Porlock when he attempted to reassert his control. The Shadow Riders then arrived and attacked Abadon, and Porlock escaped through the Mys-Tech portal back to Earth. During the struggle, Goodfellow found a portion of a transit drive, which he took with him. Abadon assaulted Mys-Tech through the portal, and the Shadow Riders led Abadon through the portal, during which Vorin magically shut the portal, trapping or destroying Abadon. Cable teleported the Shadow Riders back to their base. Boot pulled Vorin from being trapped in the portal as well. Goodfellow showed Vorin the transit drive component, which led Vorin to suspect that some of his people may have escaped destruction at Mys-Tech's hands and still survive, somewhere. Comments: Created by Brian Williamson, John Freeman, and Ross Dearsley. I never realized Goodfellow was potentially a native of Sharin, but in Shadow Riders#4, he (in conversation with Vorin) refers to Sharin as "our world." Keeping in mind the question was asked 20 years after the stories were written, I asked John Freeman, and he said, "...was Goodfellow a native of Sharin along with Vorin? Possibly. But more likely, he just lived there - we were keeping him and his origins mysterious until we worked out something, I suspect! If you follow the links to the other Shadow Riders (and Abadon) profiles, please keep in mind those had to be some of the VERY first profiles I did for the Appendix like 11-13 years ago...Abadon was early on the list after my very first (Aan Taanu), and then I probably finished out the series/characters. We've come a LONG way baby. I cleaned up Vorin a BIT while correcting an error. Che is a member of the Shadow Riders, but when he was on Arena World, he was still a member of the Warheads, secretly working against them as an ally of Cable...so I didn't list him as amongst their membership. John Freeman's Shadow Riders Guide and his profile for Vorin reveal a little more info about the planet. The guide tells us how Vorin learnt about Mys-Tech through their activities on his homeworld, which is significant as it means he didn't just teleport out as soon as they arrived. Also, Vorin's profile lists the world as Arena World (Sakria), and Vorin's place of birth as the Sharin Mountains. Presumably it was originally intended for the planet to be called Sakria, with Sharin an area on the planet. The name Sakria never appeared in the comics at all, which clearly use Sharin as the name OF the world not an area ON that world. Hence, I've left the planet name as Sharin. - Changeling. other Arenas, or anyone named Sharon, etc.